It’s impossible to keep biking to class in the winter, right? 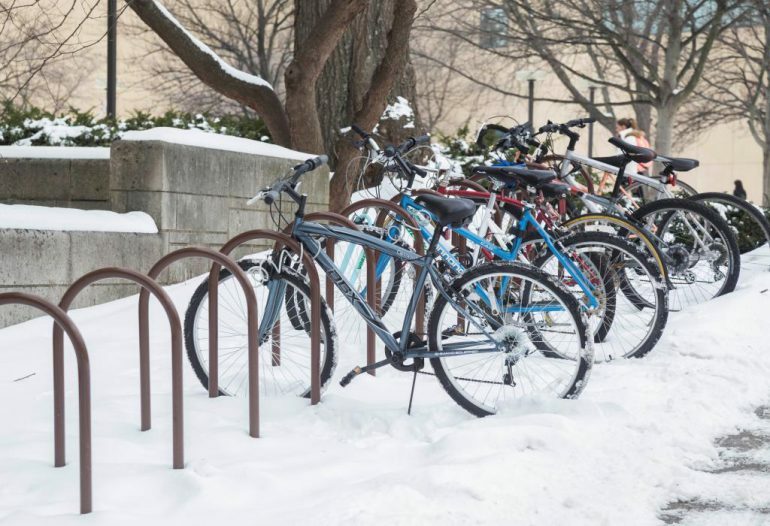 Many IU students continue to take advantage of the convenience of bike commuting year ‘round! Last winter, I rode the 2 miles from my house east of campus to SPEA every day except one. I continue to enjoy saving money on parking, getting to class in 7 minutes instead of 25 min by foot (saving time), and avoiding a frigid wait for the bus. I control when I leave and how long it takes, and I never have to depend on the bus and worry about missing it. Many of my peers live close enough to walk and enjoy the chance to slow down during a busy day. Personally, I prefer a shorter commute. In the winter, I get colder when I walk because it takes much longer. I’m generally quite toasty when I bike! I have gotten comments from classmates and professors who have noticed me continuing to bike in the winter. I’d like to dispel the myth that biking between November and March is “crazy. After all, most Indiana winter days are snow-free! Even when it snows, the roads are usually navigable shortly after. Below are some tips that will help you ride safely and confidently! 1. Light it up: It gets dark early and may be overcast during the day. Visibility is important. Make sure you have a white light in front and a red light in back. I add a red light on my helmet and LED lights attached to the spokes of my bicycle to make sure I’m very visible from the side as well. The cost varies between $10-40 for a set of lights. You can pick some up at any bike shop in town, such as Revolution Bike and Bean, Bikesmiths Bicycle Shop, Bicycle Garage, or Salk Creek Cycles. Oh, and if you repeatedly forget to turn your lights off the batteries will run down quickly and leave you in the dark. I learned that lesson the hard way. 2. Get bike fenders: Avoid the “skunk stripe,” also called the “Freshman Stripe” because I guess it takes freshman a while to figure out they really need fenders. It’s where you get mud and road filth slung up your back in wet conditions. Fenders also keep you mostly dry. Very important when if you won’t want to bring a change of clothes everywhere! The first week it rained in the fall of 2014, I was miserable. By the time I got to SPEA, my pants were soaked and I had a muddy stripe up my back. I bought fenders which deflect the water coming off the wheels from the wet road and now I stay dry and comfortable. Plastic fenders run at about $10-20 while metal fenders are more expensive. I’ve never regretted this investment! 3. Dress appropriately. Is it too cold to bike? No. But if I forget to cover my ears or wear warm gloves when it’s particularly cold, I don’t enjoy my commute. I find that if I wear lots of layers on top I end up overheated. 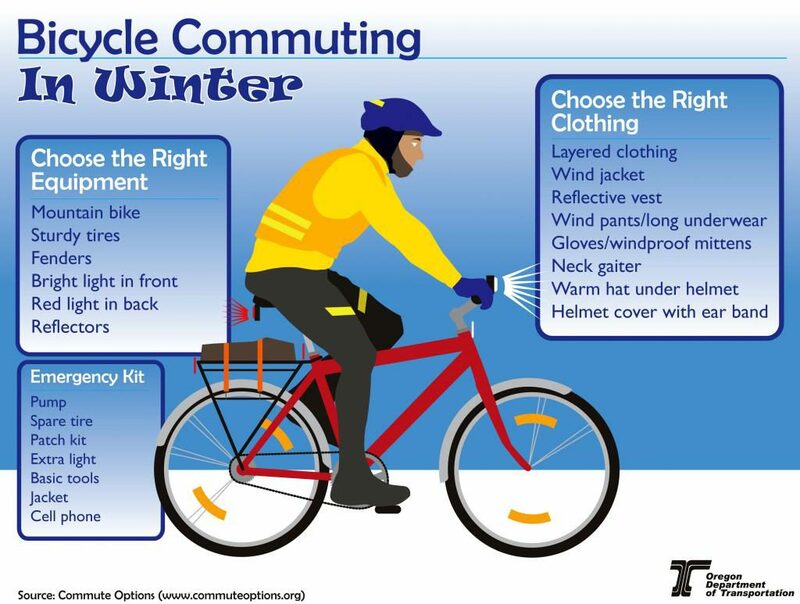 However, layers are particularly important if you’re biking for a long time. You will need: warm gloves, a scarf that can be pulled above your nose, a thin hat that covers your ears, and leggings to wear under your pants on the coldest days. Ski googles are optional. I didn’t make that investment because my commute is relatively short. Avoid wearing hoods that catch wind and inflate or obstruct your side vision. My feet stay dry on the bike so I don’t wear special shoes, though you may want to wear waterproof shoes or boots if you will be walking on uncleared sidewalks. Oh yeah, and continue wearing your helmet just like you do every day! 4. Check your tires. Your tires may go flat with the change in temperature, because very cold air takes up less room than warm air. 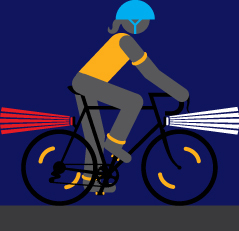 Unless you have a road bike with thin, smooth tires you should be fine. However, some people feel more comfortable with specialized winter tires. Tread and somewhat thicker tires improve traction but there is still debate about the best kind of tire to use. I have hybrid tires that I use all year. Generally within 24 hours of a snowfall, the roads are clear enough of ice and snow to allow for a smooth ride anyway. 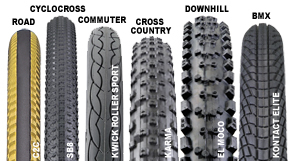 If you were doing extreme trail riding on compacted snow, your choice might be a little different – they make crazy studded tires that are a bit much for winter commuting. 5. Ride smart on ice and snow. Rule number one: SLOW DOWN. 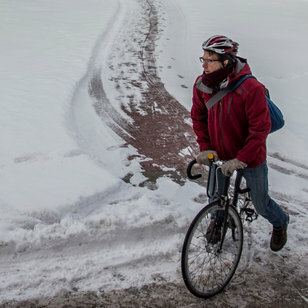 If you bike to class after a light snow fall, it may be safe with good traction. However, if there is ice beneath the snow you may choose to walk or take the bus instead. If you do forge ahead, take turns slowly and break well in advance of stop signs. Use your bell to alert your fellow students who may unexpectedly cross the road while texting! Remember not to ride on sidewalks during any time of the year. It is against IU policy and Bloomington city codes and you can receive a citation. Additionally, sidewalks are often poorly treated in snowy conditions and may be icier than roads. 6. Protect your bike. Salt and water are very corrosive. Last winter, the salt did a number on my bike – the chain, pedals, and brakes on my 1970s clunker rusted out and had to be replaced even though my bike was always stored inside a garage overnight. This winter, I went to a bike store and they helped me pick out the appropriate chain and gear lubricant and learn about winter maintenance. If you have a fancy bike, leave it at home and use a basic commuter bike. Depending on the house, apartment, or dorm you live at, you may have access to a garage or a covered bike locker to keep your bike dry and out of the elements most of the time. 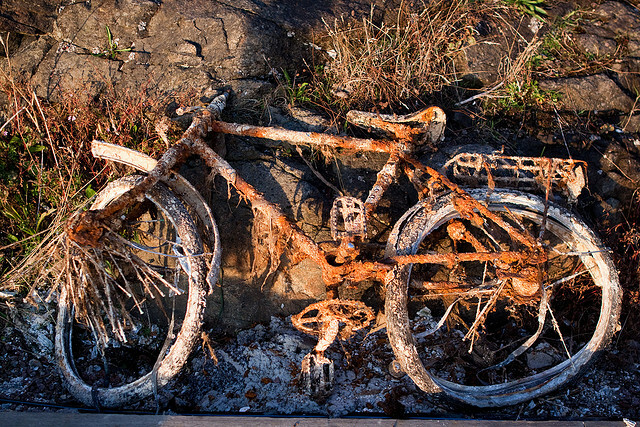 Don’t let your bike end up like this! New to biking? Use hand signals, lock your bike to provided racks, ride on the street not the sidewalk, and get a bell to alert pedestrians that may walk on bike trails or unexpectedly cross the middle of a street…and don’t forget to register your bike! Brush up on the basics at Biking in Bloomington. 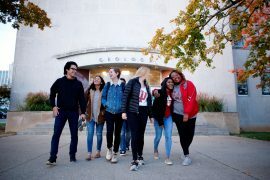 During the academic year, Leah works with IU Office of Sustainability as a Service Corps Fellow serving as the Sustainable Purchasing Coordinator. 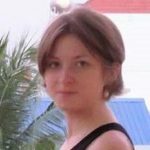 She is a 2nd year Dual Masters Degree Candidate in the School of Public and Environmental Affairs, concentrating in Energy and Sustainability. After earning a Bachelor's degree in Chemistry from Goshen College, she worked for two years as a Project Coordinator and PULSE Fellow with Allegheny CleanWays in Pittsburgh, Pennsylvania. During summer 2015, Leah served as the Renewable Energy intern with the IUOS tracking progress toward IUB's energy goals and researching renewable energy options.